UFW Stories: "The UFW in Sacramento 1972-1976"
"The UFW in Sacramento 1972-1976"
Prior to 1972 my activism had been concentrated on antiwar (Viet Nam) work, and for Dolores Delgado-Campbell, in the Chicano community. We worked together in the 1972 McGovern for President campaign and Proposition 22. The antiwar work was winding down. In the summer of 1972 the Teamsters union raided the UFW and sought to represent farm workers even though they failed a this; this is the ultimate violation of labor rights. Because of my long history of union activism, I was moved by this betrayal of union solidarity by a corrupt union. Dolores and I discussed the situation and decided to work together to help the United Farm Workers. Dolores called the UFW headquarters and said we would volunteer. They said there already was a support committee in Sacramento, headed by Joe Serna. We both knew Joe because he and I worked in the same union. We contacted Joe and found out what was being done. A boycott committee had existed in Sacramento during the prior boycott. The existing committee was centered on the Chicano artistas, who eventually become the Royal Chicano Air Force (RCAF). Jose Montoya was perhaps the best known. They helped the UFW with posters and hosted Cesar when he came to town. They also educated people about the UFW within their circle. We decided to take a more labor union/ church centered approach, and to not only concentrate on the Chicano/Mexicano community but to spread the boycott to new groups. We began by organizing picket lines at local Safeway stores and asking people to not buy grapes. We stayed in touch with Joe Serna. We did not meet regularly with him, but we relied upon Joe for our political front. He handled all political matters, including the Democratic Party. For example, the UFW shared a desk in the Mc Govern campaign for their Proposition 22. One time when we were bill boarding over a freeway overpass he called to tell us to get down from there. He said the call had come in from La Paz. We began to picket regularly and recruited supporters. This began a four year experience of picketing each week at a local store. At times we would have 10-12 volunteers, at times only 3-4. The Catholic Newman Center served as a place to meet and to plan. A small group of regulars formed, which sustained the effort. Picketing taught us a great deal about political discipline and staying on the subject. The Sacramento effort remained a volunteer effort from 1972-1977. Sacramento can get to 108 degrees in the summer, and it is cold and wet in the winter - but we kept the picket lines going. We did not have any fulltime UFW staff except on brief projects, such as Proposition 14. I was surprised to picket in Sacramento. I had been raised in a union town, Waterloo, Iowa, and worked in a union town, Pittsburgh, Pennsylvania. Where I was raised, union working people did not cross picket lines. Here in Sacramento the general public and many union members did cross. They seemed to dismiss the farm workers as Mexicans, not really a union issue. Later I got on the Sacramento Central Labor Council and came to understand more about the weak level of union solidarity in California. Basically the UFW boycotts were won or lost in large union cities such as New York, Chicago, Toronto, and Pittsburgh. In these areas grapes and lettuce were not moving. Union and UFW work in California was highly racialized. Many responded or refused to respond to a union appeal based upon the racial nature of the UFW. And, in the Mexican- American community many in the business class and the emerging “Hispanic” professionals actively opposed the UFW. Today many of these same people claim to have supported the UFW. This is similar to the history of M.L. King. He too was opposed often in his own community as too radical. These divisions are one of the several ways that ideological control is exercised. Sacramento has thousands of people who work in the fields or have recently worked in the fields. When we held food drives or funding drives for farm workers, working class Mexican families were generous and supportive. On several occasions small groups of people, or families would collect enormous amounts of food and clothing to send to Delano or other locations to support striking workers. We encountered a number of issues on the picket lines. Nonviolence was a fundamental issue of the UFW and of Chavez personally. One time a customer purposefully sped up in the parking lot and ran into me with his car. Luckily, I fell backward between two cars and received only minor injuries. We called the police. They came, heard the story, and declined to pursue the matter. They decided that there was no crime. Someone in our group got the license number. Through a friend, we contacted the Department of Motor Vehicles and located the person. I went to their home and explained to them that their action was assault with a deadly weapon (a car), but that the injury was minor. I was not going to pursue further action. This event, and others, tested and developed my own commitment to nonviolence. included getting her job back. Later Dolores Huerta spoke at the American River College campus and at the CSU-Sacramento campus a number of times. Working with the UFW also led us to be more active in our unions. I was active in the California Federation of Teachers where a farmworker support committee was created. This led me to some support work for Bert Corona at CSU- Los Angeles, where Bert was not being re-hired because of his political work. This work with Bert led to several decades of work in the immigrant rights movement. At CSU-Sacramento groups of students helped with the picketing and with the electoral campaigns such as Proposition 14. 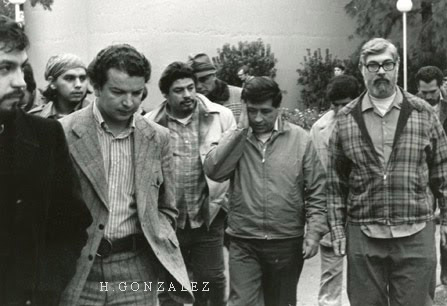 The UFW was an educational and an organizing experience of great value to campus and union politics. We brought Cesar Chavez to speak several times, twice getting large fees for his speech (over $1,000). He also came for a two-day workshop with the Mexican American Education Project students where he taught us community organizing. We also brought Dolores Huerta and Philip Vera Cruz to speak. We consistently tried to interest students in participating in the UFW projects because such political participation is an excellent educational experience. It develops a critical perspective on U.S. politics. Certainly, the UFW work helped to establish Chicano Studies at American River College and CSU-Sacramento. The Sacramento efforts were nourished by the consistent volunteer work of a number of people, far too many to list. However, a core group consistently worked with us for months and years. This core group in addition to Dolores Delgado-Campbell and me, included Manny Hernandez, Arturo Fernandez, Rosie and Ernie Calvillo, Luisa and Mike Menchaca, Arturo and Carmen Garcia, and Dan Bacher among others. We would add to the core by recruiting regularly at the local college campuses. Outstanding student allies included Maria Avila and faculty member, Jose Montoya. The RCAF assisted us with posters. The large statewide campaigns such as the March on Gallo (Modesto) and the later Strawberry Workers campaign helped us build our group. When up to 30,000 are in the streets you come to understand that you are a part of a much larger movement. In the summer of 1975, the new Agricultural Labor Relations Law had been passed and the effort of the boycott was switched to efforts to win certification elections. Working for the UFW brought us many friends. One time the UFW brought some100 families to Sacramento for a demonstration at the capitol. They had no place to sleep. So, over 50 families slept out in our backyard and all used our one bathroom and shower. The neighbors were quite surprised to see such a line of cars and so many people. They asked if all these people were our relatives in town for some event. On several occasions we made lasting friends with UFW members and supporters. We particularly got to know Philip Vera Cruz. For decades later in other political and union efforts we encountered former UFW volunteers and we could usually trust them and rely Upon them for some common sense. There was a bond among us that created a community of caring. The work with the UFW taught me more about the U.S. and California political systems than I could have ever learned from a book or a university. And, it taught us about organizing and working with people. The experiences shaped our lives for the better. I greatly appreciate all that I have learned and most of the people I have met. Duane Campbell, Professor (emeritus), Bilingual/Multicultural Education, CSU–Sacramento. Author: “Choosing Democracy: a practical guide to multicultural education.” 2004 Merrill/Prentice Hall. 2010. In the photo. Cesar, Fr. Keith Kenny, Duane Campbell, Steve Arvizu, Ricardo Torres and others.